Arthropods (e.g., insects and crustaceans) must molt their exoskeletons periodically in order to grow; in this process the inner layers of the old cuticle are digested by a molting fluid secreted by the epidermal cells, the animal emerges from the old covering, and the new cuticle hardens. The molting process is a central, and nearly continuous, part of a crab’s life. A crab may spend 90% of its time getting ready to molt, molting, or recovering from a molt. There are many dangers to molting including predation, difficulty in movement as muscles have no ridged points of attachment, desiccation, and the risk of an unsuccessful attempt to exit the old exoskeleton. Eighty to 90% of arthropod deaths are related to molting. A hermit crab will shed their exoskeleton when it becomes too snug about their growing body. Hermit crabs cannot go shopping for new skin, they instead shed their exoskeleton and build up the tender tissues with fluids and with the help of chitin, they develop a hardened exoskeleton. To be able to do this, your hermit crab will need a lot of moisture. You might find your crab near the water dish a lot prior to a molt. If you were to watch your crab molt, you would see your crab stretch and twist until the exoskeleton splits, then slips out of it like a suit. Some crabs cannot do this in one piece, so you may see legs and claws strewn about. Arthropods molt periodically in order to grow and mature. Triggered by hormones released when its growth reaches the physical limits of its exoskeleton, the molting begins (apolysis) when the cuticle separates from the epidermis due to the secretion of a molting fluid into the exuvial (cast-off skin or cuticle) space. The endocuticle (chitinous inner layer of the cuticle) is then reabsorbed and a new epicuticle (outer, shiny or waxy layer) secreted. Ecdysis is the act of shedding whatever remains of the old cuticle. There are four phases of the molt cycle: intermolt, premolt, molt, and postmolt. During the intermolt, the exoskeleton is fully formed and the animal accumulates calcium and energy stores. It is the longest phase and constitutes the time between molts. Premolt starts when the old exoskeleton begins to separate from the epidermis (skin), and the new exoskeleton begins to form below. Calcium and other nutrient are reabsorbed from the old exoskeleton at this time and stored in the tissue of the crab. This serves the dual purpose of softening the old exoskeleton and recycling the calcium for the new exoskeleton. The muscles in the pinchers and limbs then shrink in anticipation for when they are to be pulled out of the narrow joints of the old exoskeleton during the molt. Molting occurs as the old exoskeleton cracks and the crab pulls out of it backwards. The new exoskeleton continues to form and is pale and soft. Bloating with water is responsible for the increase in size after a molt. In the case of land crabs who may not have access to water directly after molting, this water comes either from the shell water (which they carry around with them in their shell), and/or from water accumulated in the blood and water sacs during preecdysis. This water pressure is used to stretch the new soft exoskeleton into a larger form. After some rest, the crab eats its old exoskeleton as a source of calcium and other nutrients. Postmolt occurs as the new exoskeleton hardens through the two processes of sclerotization (tanning) and calcification. Sclerotization is the chemical process where proteins form chemical bonds between each other to form a more rigid structure. Calcification is the process of putting calcium into the exoskeleton. Also in this phase the muscles grow back to their natural size and the excess water is lost, leaving room for further growth throughout the intermolt. Step 9: Tanning — sclerotization(The hardening and darkening processes in the cuticle (involves the epicuticle and exocuticle with a substance called sclerotin) of new exocuticle. Now the chitin and protein are laid down and the exoskeleton will become hardened and shiny after a few weeks. Land Hermit Crabs that are eating foods high in calcium, fiber, chitin and foods high in nutrients their bodies need will often have a much higher molting rate; which slows with age or lack of larger seashells. If a crab is in a seashell, which is snug with no alternatives, they will not molt as readily as one with a vast selection. Exercise is known to increase hunger, and thus will affect the rate of molting. In the wild, land hermit crabs have been known to walk many miles a night, and graze on foods along the way. A hermit crab can be safely exercised in the tank with a plastic hamster wheel. Scientist Mike Oesterling of the Virginia Institute of Marine Science has noted this in Blue Crabs. Hermit Crabs are social animals, and as such, there is usually a ‘pecking order’ among groups or colonies. As with many animals and organisms, when there is a scarcity of resources you will see a ‘pecking order’ among hermit crabs. 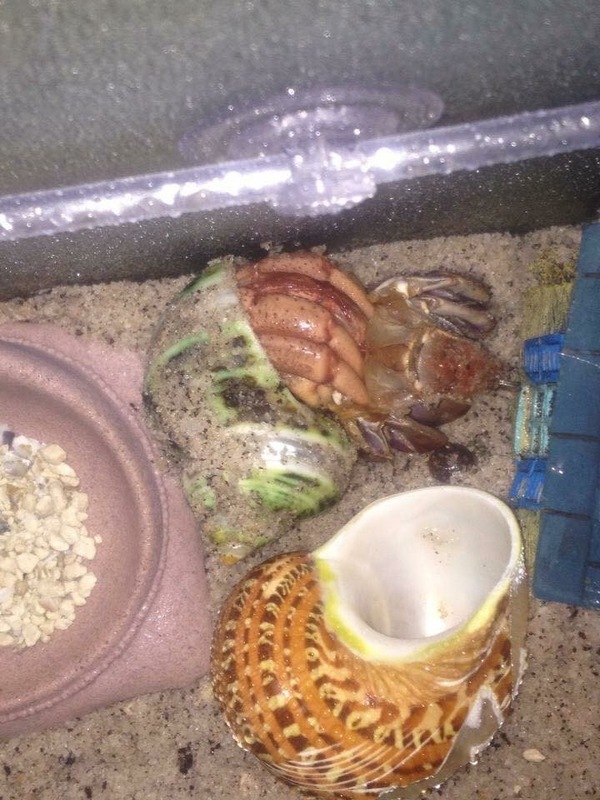 The resources most important to hermit crabs being protein and calcium-rich foods and varied diet; hiding spots; space to dig down to molt; different sizes of seashells; water; and salt water. If a crab is ‘top crab’ than it would get the most food, like with puppies and seagulls. We see this on a small scale within the crabarium, where hermit crabs vie for position in the food bowl or a favourite hiding spot. I have often watched my jumbo hermit crabs fighting for access to the salt-water bowl or Treat dish. It is not unusual for them to fill the bowl completely and keep other hermit crabs away, defending their right to eat first. Because water pressure is the driving force behind the expansion of the new exoskeleton, it is very important that hermit crabs live in a very humid environment and have access to water that is deep enough to fill their shells. Also, hermit crabs make their blood saltier during a molt to have the water gain necessary for the expansion. Thus a salt water pond is essential for the regulation of this process as well. University of Massachusetts Amhurst: Biology 497H – Tropical Field Biology. Mike Oesterling of the Virginia Institute of Marine Science. Quote relates to blue crabs. Fletcher, W.J., Brown, I.W., Fielder, D.R., and Obed, A. 1991b. molting and growth characteristics. Pp. 35-60 in: Brown,I.W., and Fielder, D.R. (eds), The coconut crab: aspects of Birgus latro biology and ecology in Vanuatu. Canberra, Aciar Monographs 8. Greenaway, P. 2003. Terrestrial adaptations in the Anomura (Crustacea: Decapoda). In: Lemaitre, R., and Tudge, C.C. (eds), Biology of the Anomura. Proceedings of a symposium at the Fifth International Crustacean Congress, Melbourne, Australia, 9-13 July 2001. Memoirs of Museum Victoria 60(1): 13-26. Greenaway, P. 1985. Calcium balance and molting in the Crustacea. Grubb, P. 1971. Ecology of terrestrial decapod crustaceans on Aldabra. Hobbs, H. H., III. 1991. Decapoda. In Ecology and Classification of North American Freshwater Invertebrates. J. H. Thorp, and A. P. Covich (eds.). Academic Press, New York, NY, p. 823-858. Ruppert E. E. and Barnes. 1994. Invertebrate Zoology 6th ed. Saunders College Publishing, Philadelphia. Crustacea Vol. 9: Integument, Pigments, and Hormonal Processes. Academic Press, Inc. New York. Previous Post: FAQ Should I feed my hermit crab meat? Next Post: FAQ Is my hermit crab dead or molting?